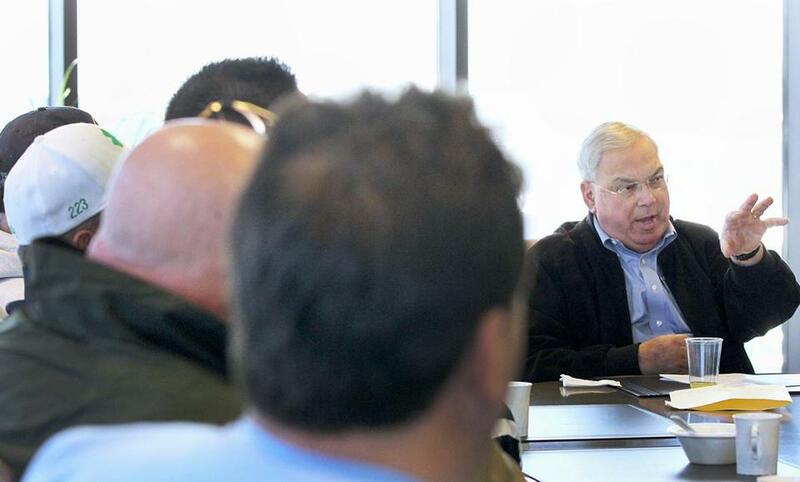 Mayor Thomas M. Menino and local union leaders discussed how to aid Elizabeth Warren. With the election 25 days away, Mayor Thomas M. Menino huddled in Dorchester with more than a dozen of the city’s building and trades union leaders Saturday to figure out how to persuade voters — including many in organized labor — to cast their ballot for Elizabeth Warren for US Senate. Martin F. Walsh, business manager of Laborers Local 223, said he has talked to union members such as teachers, police officers, and electricians who insist on voting for the Republican incumbent, Scott Brown. Walsh, 57, cautioned the leaders to make sure they talk to members of their own families about the race. Walsh’s cousin, state Representative Martin J. Walsh — both men were named after their grandfather — said in an interview after the meeting that there is a misperception that the rank and file vote in lockstep when unions announce support for a candidate. In 2010, after Brown defeated Democrat Martha Coakley in the special election, a poll found that 49 percent of union voters chose the Republican. In September, 46 percent of 132 union members said they supported Brown while 41 percent supported Warren, according to a Suffolk University/WHDH Channel 7 poll. Menino called the meeting on Thursday, marking the first time in recent memory that union leaders gathered with the city’s mayor to discuss campaign strategy. The gathering underscored the urgency many of them feel about the outcome of the tight Senate race between Warren and Brown. The union leaders represent a variety of laborers, including pipefitters, sheetmetal workers, and painters. They said they have 75,000 members in Boston who could be the key to bringing victory to Warren if they canvass the city and turn out to vote. On Saturday, about 700 union workers rallied at an event organized by the AFL-CIO in Malden before spreading out to cities and towns in Middlesex County to stump for Warren. Representative Walsh said more than 100 members from Laborers Local 223 are planning to meet in Dorchester on Sunday, then fan out to Hyde Park, Allston-Brighton, and Charlestown. At the meeting, a Menino aide stressed that members should call other members directly, and also reach out to other people in the household who are eligible to vote. Throughout the meeting, union leaders said they are stressing to members and others Brown’s votes against several jobs bills; his opposition to an earmark in the defense budget that helped fund a program connecting war veterans to the construction field; and his decision to hold up extensions to unemployment insurance to extract concessions on other issues, such as tax cuts. Menino, whose get-out-the-vote machine could be crucial to Warren’s chances, told the leaders to meet weekly, for an hour, to gauge how their efforts are going. Brown’s campaign said he has received the endorsement of various police organizations, including the Boston Police Superior Officers Federation, the Worcester Police Patrolmen’s Union, and the unions representing patrol officers and sergeants from the MBTA. On Saturday, he picked up the support of the Lowell Police Patrolmen’s Association. The Brown campaign said union workers’ support of Warren should be viewed skeptically, pointing to an online video that shows a carpenters union member telling a Republican tracker that he would be fined $250 if he did not attend. “This type of behavior is disgraceful, and Warren should immediately condemn these tactics and apologize to union members who have been compelled by their leadership to support her against their will,” said Brown spokeswoman Alleigh Marré. Mark Erlich, executive secretary treasurer of the New England Regional Council of Carpenters, said the worker was describing an annual assessment that is waived when members do community service, which can include attending a political rally. The Warren campaign e-mailed the Globe photos of the candidate and labor leaders speaking at the rally in Malden.